We’re very strict about who we work with and only invest across the best lenders in the sector. We aim to control risk and provide diversification across different lenders and different credit sectors. We invest a huge amount of time in upfront and ongoing monitoring. Goji’s lending partners cover sectors like renewable energy, short term SME loans, higher and further education, and property. This pie chart shows a snapshot of the percentages we invest in different sectors, but we adjust it regularly to optimise returns for our investors. 1 How do I invest? 2 How do I get repaid? 3 How do you take security? Invest through our digital platform at any time. Investments are executed on or around the 26th of each month. Interest repayments are reinvested through the investment term and all capital and interest is repaid at the end of the term. How do you take security? Bondholders are secured against the underlying loans. These loans themselves are all secured and have solid assets backing them up. 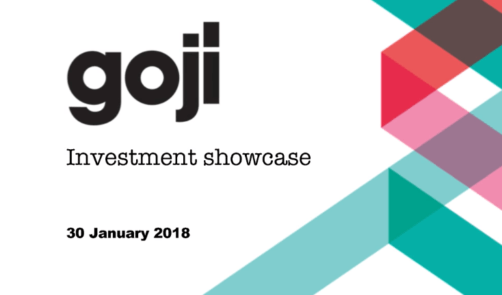 Goji's showcase event is standing room only! if you’re not sure, you might want to speak to a regulated financial adviser. We always like feedback so if you think something’s missing, or could be clearer we’d love to hear from you.